Smoking causes health problems—we know this; it’s common knowledge. The dangers of secondhand smoke are similarly understood, but when we start to talk about thirdhand smoke, there is much that we need to learn. A recent talk at the 247th National Meeting and Exposition of the American Chemical Society indicated that thirdhand smoke isn’t only dangerous, but could lead to DNA changes and even cancer. The talk was presented by Bo Hang, a scientist at Lawrence Berkeley National Laboratory, who published a study on the topic, “Thirdhand smoke causes DNA damage in human cells”, in a 2013 issue of the journal Mutagenesis. According to Hang, thirdhand smoke—or the residue from smoking found on surfaces and in dust in a room or area where someone previously smoked—can produce toxicants that undergo chemical changes when they encounter compounds in the air. One of these compounds created by thirdhand smoke is 4-(Methylnitrosamino)-4-(3-pyridyl)-butanal, or “NNA”. NNA, says Hang and his colleagues, can attach itself to DNA and create a cancer-causing chemical, according to MedicalNewsToday. NNA and another compound known as NNK break down DNA, damaging it in such a way that leads to uncontrolled cell growth and the possible formation of tumors. While Hang’s research is still in its early stages, he says we have only begun to understand the full damage that thirdhand smoke can cause. Babies and toddlers may be most at risk of these dangers because they are still developing and because they are most likely to swallow, touch, and inhale these compounds as they crawl around, touching everything in their path and frequently putting their hands in their mouths. This isn’t the first such troubling research on the topic. A previous study said that secondhand smoke isn’t the only culprit in sickening children with parents who smoke. 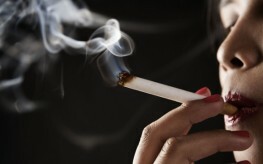 Thirdhand smoke, researchers from the University of California-Riverside said, could be as dangerous as firsthand smoke. Just as it took decades for us to understand the risks of smoking, and decades more to discover how dangerous secondhand smoke was, it will take time for the real effects of thirdhand smoke to become apparent. “There is still much to learn about the specific mechanisms by which cigarette smoke residues harm non-smokers, but that there is such an effect is now clear,” remarked Professor Manuela Martins-Green of the UCR study.